I love this series of books, always a good read, terrific characters. It’s all about friendship, love and dealing with life’s ups and downs. Best Beach Ever is a perfect book to start my summer. I want to go stay with Nikki, Kyra, and the rest of the wonderful women. I want the beach sunsets with the women toasting their lives, the listening to the trials of their days, and to find the happiness they find with each other and in their lives together. There are many sub-stories that come together to tell the story of the Ten Beach Road ladies. Anyone who reads should find at least one character they connect with. There is great diversity in the characters. Nikki is an older mom of twins who is overwhelmed with life but wanting to prove that she can handle it all. Kyra is dealing with life as a single mom and an ex who is expecting more than she feels she can give. Avery is afraid to commit to the man she loves. Bitsy is a person who is looking for revenge on her ex-husband. With each character, there was something I could relate to and could feel what they were feeling in life. This is a series. The book can be read without reading the rest of the book in the series but I think the reader will miss some of the most special, important moments of the book if they don’t know the history of the characters. The back stories are important to know why they are how they are now and what they truly need out to be happy. Best Beach Ever by Wendy Wax is the sixth novel in Ten Beach Road series. January 2 has rolled around, and the ladies have moved out of Bella Flora, so tenant can move in. They have into their cottages at the Sunshine Hotel. Madeline Singer is getting ready to go on tour with her rocker boyfriend, Will. Kyra and her son, Dustin will be departing in two weeks for Orlando where Dustin will make his acting debut in his father’s, Daniel Deranian new film. Kyra is not looking forward to spending six weeks in the company of Daniel’s wife, Tonja Kay. Nicole Grant Giraldi and her husband, Joe are busy as the parents of active twin daughters. Nicole has not lost her baby weight and is unhappy with her body image. Avery has a new project designing a tiny home. She likes Chase Hardin, but she is unable to commit. Something is holding her back. Bitsy Baynard realizes her husband is not returning (it has been over a year), and she is trying to locate Bertrand along with the money he stole. These ladies are friends (family) through the good times and the bad. They have been through rough times and come out the other side better for it. Come along for another journey with the ladies and see if they get their happily ever after. Best Beach Ever is my favorite book in the series. It is a well-written and engaging story. You do need to read the Ten Beach Road series in order or you will be lost. There are too many characters and backstories. These ladies have been on a journey. They were taken advantage of in a Ponzi scheme and received Bella Flora as a settlement. They had a successful television show and then lost it. They now must rent out Bella Flora to recoup their loss. The benefit is they are all together at the Sunshine Hotel and Beach Club. These women have a great friendship. Maddie is the matriarch of the group and she dispenses valuable wisdom to the group. It has been lovely to watch these women grow over the course of the series. I admit to being frustrated with Kyra and Avery in this installment (just wanted to shake some sense into them). It was nice to watch each woman come into her own. It is a sweet, feel good novel. I am giving Best Beach Ever 4 out of 5 stars. 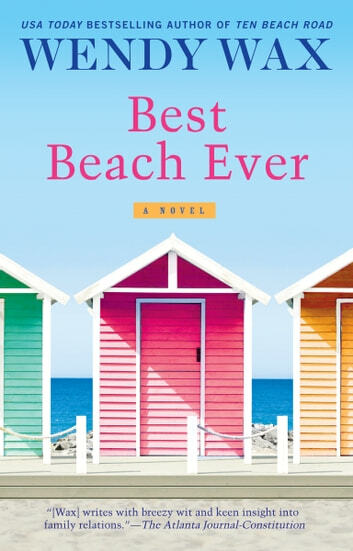 Best Beach Ever is the perfect summer novel.